With the July 12 signing deadline for draft picks fast approaching, the Red Sox officially signed a handful of players this week, including second-rounder Teddy Stankiewicz (pictured), seventh-rounder Mike Adams, 16th-round pick Jalen Williams, and 17th-rounder Joseph Monge. Only two of Boston's first 19 draft picks remain unsigned, with fourth-round pick Myles Smith and 13th-rounder Jordan Sheffield still negotiating. The Red Sox were also busy in the international market, as the signing period opened on July 2. Ben Badler of Baseball America reported that the Red Sox signed Yohan Aybar, an outfielder from the Dominican Republic for $450,000. The Red Sox also reportedly agreed to terms with third baseman Rafael Devers, according to Dionisio Soldevila of ESPNDeportes.com, and left-hander Emmanuel DeJesus, according to Jesse Sanchez of MLB.com. Devers, who was ranked as the third best international prospect by Baseball America, signed for $1.5 million, though Badler notes that he has not officially signed yet. DeJesus, who was ranked 24th in the class by MLB.com, signed for $780,000. If these signing bonuses hold, the Red Sox will have spent $2,730,000 of their $3,179,900 bonus pool for international signings. It has been an up-and-down season for Matt Barnes in Portland, and our Senior Columnist Jon Meoli caught up with Barnes after one of his better starts. Barnes tells Meoli that "numbers are very misleading", while Portland pitching coach Bob Kipper and manager Kevin Boles offer some interesting insight into the right-hander's season. Meoli stayed busy, interviewing Blake Swihart after a recent game in Salem. Swihart says he is happy with how his catching has progressed this season, a sentiment that is shared by Michael McCarthy, the former Salem pitcher who threw to Swihart for most of the season before his recent promotion to Portland. Our Northeast Scout Ian Cundall has frequented several Spinners games since the season started, and he recently filed a Scouting Scratch on three interesting arms. Cundall talked about the gap between Ty Buttrey's present and future, Sergio Gomez's polished secondary pitches, and Taylor Grover's interesting arsenal. Will Middlebrooks wrote a great piece for ESPNBoston.com, talking about how he is dealing with his demotion. Middlebrooks said he was having "good, consistent at-bats" in Triple-A, and that was evident on Wednesday, when he went 4 for 5 with a double, two home runs, and tied a team record by driving in eight runs. He showed his old swing on this grand slam, taking a fastball out to deep right-center field. Middlebrooks was the designated hitter on Wednesday, and taking his place at the hot corner was Xander Bogaerts (pictured). Bogaerts, who never played third base in the Red Sox system but did play there in the World Baseball Classic, has shown that his bat is almost ready for the big leagues. Playing third base will add some versatility to his defense, which may allow him to help the Red Sox this season. Rubby De La Rosa's scoreless inning streak was snapped at 21 in his most recent start, but his performance this season got him named to the International League All-Star team. He will be joined by teammate Anthony Carter on July 17 in Reno, Nevada. After allowing 10 runs in his first 6 2/3 innings this season, De La Rosa has allowed only six earned runs in his last 51 2/3 innings for the PawSox. He has allowed only 32 hits and 19 walks in that stretch, while striking out 54. Tuesday was an exciting night in Portland, as Keith Couch pitched a complete game in the front end of a doubleheader, and then Travis Shaw hit a walk-off home run in the second game. Kevin Thomas of the Portland Press Herald talked with Couch after the game, and Couch said he "kicked it up a notch" after a tough first inning. Shaw was not the only player to hit a walk-off home run this week, as Brandon Jacobs hit one in Salem on Saturday. Jacobs told Aaron McFarling of the Roanoke Times that it was the first walk-off home run he hit since middle school. Despite having little success with drafting football players last season, the Red Sox took a similar strategy this season, drafting University of Florida quarterback Jeff Driskel in the 29th-round. Alex Speier of WEEI.com reported that the Red Sox signed Driskel, though he will still play quarterback for the Gators this season. Driskel was a well-regarded talent in high school, but he has not played competitively since. The Red Sox have secured his rights if he ever decides to pursue a professional baseball career. He has been flying under the radar since he was sent down to Triple-A, but Jackie Bradley, Jr. is quietly putting up impressive power numbers for the PawSox. In his last 16 games, Bradley is hitting .296/.367/.648, with five home runs, eight doubles and a triple in 71 at-bats. His total Triple-A line of .298/.387/.539 is very impressive, and he is another player who may help the Red Sox later this season. 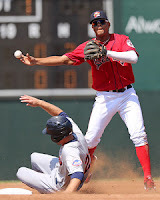 With the draft signing deadline looming, make sure you are following both SoxProspects News and our Draft History page.